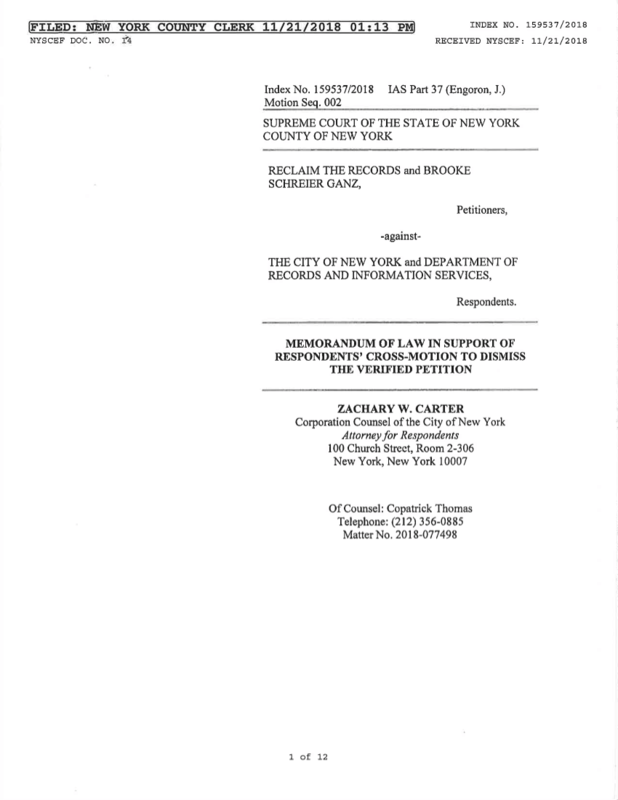 We filed a New York State Freedom of Information lawsuit, also known as an Article 78 Petition, against the New York City Department of Records and Information Services (DORIS) in the Supreme Court of New York on October 15, 2018. The case is still pending. Welcome to the single stupidest lawsuit that our organization has ever had to file. Alternately, we could subtitle this story let’s all gather round and watch the NYC Department of Records light taxpayer money on fire! You might remember our friends at the New York City Municipal Archives from our very first lawsuit back in 2015, the one that sparked the formation of Reclaim The Records, where we fought them under the New York Freedom of Information Law and won the first-ever public copies of the New York City marriage license indexes. Since then, we’ve acquired many other records sets from the Archives, without much fuss or bother, including the 1924 List of Registered Voters, which is online, and the microfilms of the New York City Geographic Birth Index, which are still in the process of being digitized. Well, the Municipal Archives holds many wonderful treasures in its vaults, but very few of them have ever been available to people outside of the building. So, a few months ago, we at Reclaim The Records made a new FOIL request asking for a copy of their master microfilm database, along with many specific inventory lists for interesting records sets. And in July 2018, we made the first of what will probably be many, many FOIL requests that our organization has committed to making over a multi-year period from the Archives, picking and choosing some of these historically important record sets from those inventories. 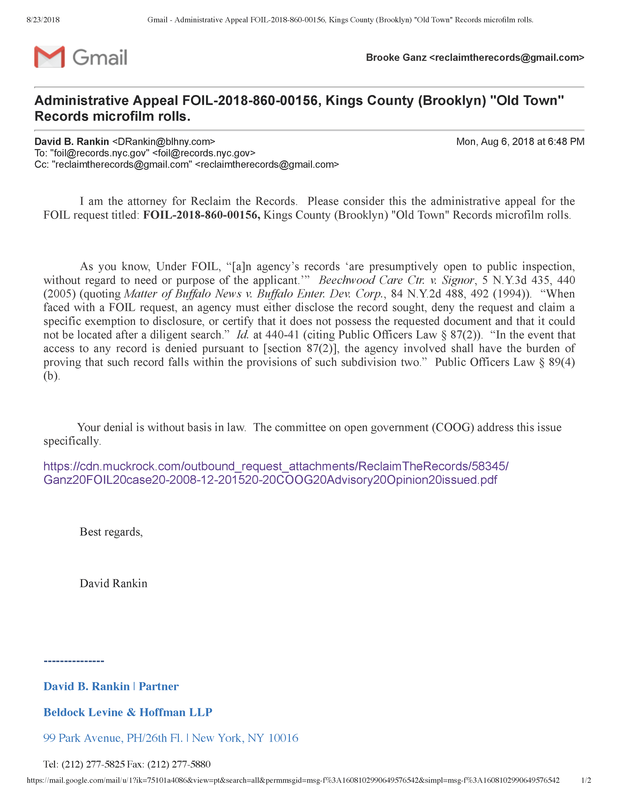 This new FOIL request — filed through the MuckRock portal, of course, because we like doing our work out in the open where everyone can see it — was for a really awesome records set called the Brooklyn (Kings County) “Old Town” Records. We asked for copies of the approximately 143 microfilms of this records set, which is a lot of material but not unreasonable. There are many other records included as part of these Kings County Old Town records, and only about 20% of the materials were ever microfilmed, but we decided to start with just those films because it’s easier and less expensive for us to get microfilms copied under FOIL. And these old Brooklyn records are, from all accounts, AMAZING. They’ve never been online. They’ve never been on any paid genealogy website. They’ve never been allowed to be copied by FamilySearch. They’ve only ever been avilable in the Archives building…if you knew where to look and what to ask for. They’re a mish-mash of surviving records from all the little old individual towns in Kings County (Flatbush, New Utrecht, Williamsburg[h], Flatlands, etc. ), before they eventually got swallowed up into Brooklyn, and before Brooklyn then was merged into New York City. Some of them start in 1670, during the Dutch Colonial period. No, that’s not a typo. And they go all the way up to 1898. There are births, marriages, deaths. Again, these have never been online before, or anywhere else before. There are tax assessment lists and military draft lists. There are lists of troops, both before and during the Civil War (listed in the inventory as the “War of Rebellion”). There are lists of school children. There are deeds. There are mortgages. And this is only talking about the 20% of this record set that was ever microfilmed. And we saw this inventory of these records and we were like WE HAVE TO GET A COPY AND PUT THIS ONLINE. WE HAVE TO. NOW NOW NOW. HOW HAS THIS NEVER BEEN ONLINE OR AVAILABLE BEFORE, WTF. Pursuant to the New York Freedom of Information Law, and acting on behalf of the 501(c)3 non-profit organization Reclaim The Records, I hereby request microfilm copies of the approximately 143 microfilm rolls of the Kings county (Brooklyn) “Old Town” records. These microfilms were originally created by St. Francis College and were given to the New York City Municipal Archives with other materials circa 1988. In a previous FOIL request to your agency that was resolved a few weeks ago, we received a PDF copy of the finding aid to these microfilms from the Archives , to which your agency may refer if needed. These documents will be made available to the general public, and this request is not being made for commercial purposes. We are going to digitize all the microfilms and put them online for free public use. Please inform me of the total charges in advance of fulfilling the request. Thank you in advance for your anticipated cooperation in this matter. I look forward to receiving your response to this request within 5 business days, as the statute requires, as required by law. We didn’t think it would be a big deal. After all, hadn’t the Archives learned from their experiences over the past few years? Well, no. Apparently not. We found out to our surprise that our FOIL request was rejected by the head of the Archives. Below is the content of the e-mail we sent to the Archives when we saw their rejection. We have decided to share it with the community. We hope you’ll find it educational. You rejected our simple FOIL request for copies of the Brooklyn “Old Town” microfilms? Microfilms of government records that are open to the public and not restricted? Are you serious? 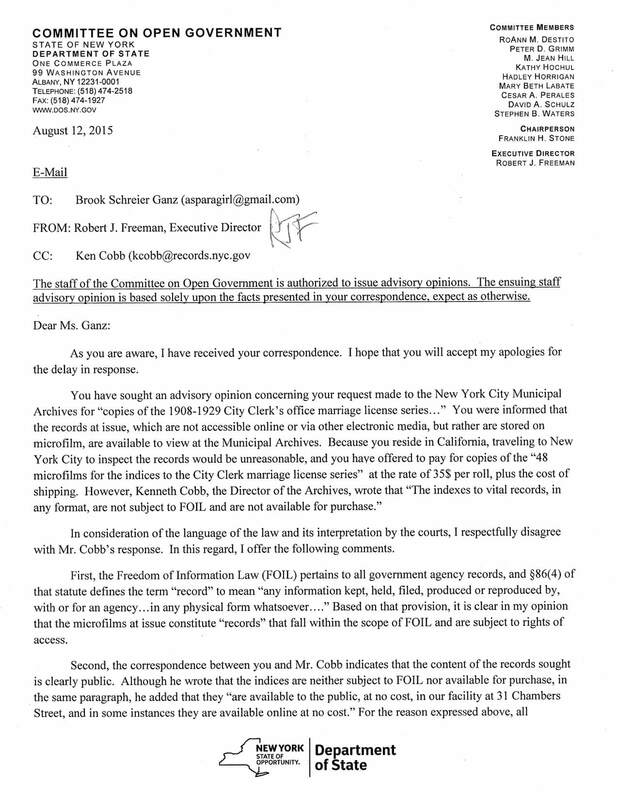 This is literally the exact same legal issue that we at Reclaim The Records and you at the New York City Municipal Archives went through when we requested the city marriage license indexes from you in 2015. And perhaps you might recall that we won that issue, and won the records, in a lawsuit settlement, right? I mean, I know you personally had to sit for a deposition in the case, so I would think you’d remember? All records — yes, ALL — that are already open and available to the public at the New York City Municipal Archives are covered by FOIL, period. All of them. I know you don’t like hearing that, but that is the law. And it’s not even a new law or an obscure law, it’s over forty years old! I have to say I’m really disappointed in you, and in the Archives and DORIS, for choosing to waste more time and more taxpayer money going through this exact same issue with us again, and with the exact same dumb reasoning. If you’re going to reject our FOIL requests out of hand, could you maybe get some new and improved dumb reasoning, just to keep things spicy? I mean, your statement “[y]our request under the Freedom of Information Law (FOIL) is being closed because the records are publicly available” is literally going to get you laughed at by our attorney, your attorney, and the judge. You’re flat-out admitting that these are publicly available and non-private non-restricted government-created records held in a government archive — which by definition means they are covered by FOIL. It’s not like this is even some kind of hinky legal grey area, it’s the obvious and plain meaning of the law, with decades of court cases to back it up. Including our own court cases! If you don’t believe me, you’re welcome to call up Robert Freeman and his legal team at the New York State Committee on Open Government (COOG) in Albany for a free second opinion on this. They are happy to help both FOIL requestors and New York State government agencies learn more about the law. Their consultations are totally free, and they’ll usually get back to you within twenty-four hours. Their phone number is (518) 474-2518. Go, call them. COOG is the same group who drafted and submitted an Advisory Opinion to DORIS on Reclaim The Records’ behalf, back during our 2015 lawsuit against you, remember? The one where they warned you in writing that Reclaim The Records was legally entitled to copies of the marriage license index records, but you chose to ignore them anyway? The one where they flat-out told you that yes, all open-to-the-public records at the New York City Municipal Archives are definitely covered by FOIL, specifically including microfilms? To help jog your memory, I have attached a copy of that 2015 Advisory Opinion from COOG to this e-mail. Please, please read it this time. Based on the data from Reclaim The Records’ three (three!) successful lawsuits and settlements with New York City agencies in the past four years, I would estimate that your rejection of this FOIL request is going to cost DORIS probably ten to twelve thousand dollars, when you get done paying both your attorney fees and ours. That’s ten to twelve thousand dollars taken from New York City taxpayers, for no obvious reason other than your own stubbornness. I don’t even live in New York anymore, but I’m still thoroughly annoyed at that number on their behalf. Our attorney, Dave Rankin, will be filing the FOIL Appeal with you in the next few days. At that point, you’ll probably reject it, and then we’ll all move on to the lawsuit, and then you’ll be delivering the copies of the records to us and cutting a check to Dave by the end of the year. 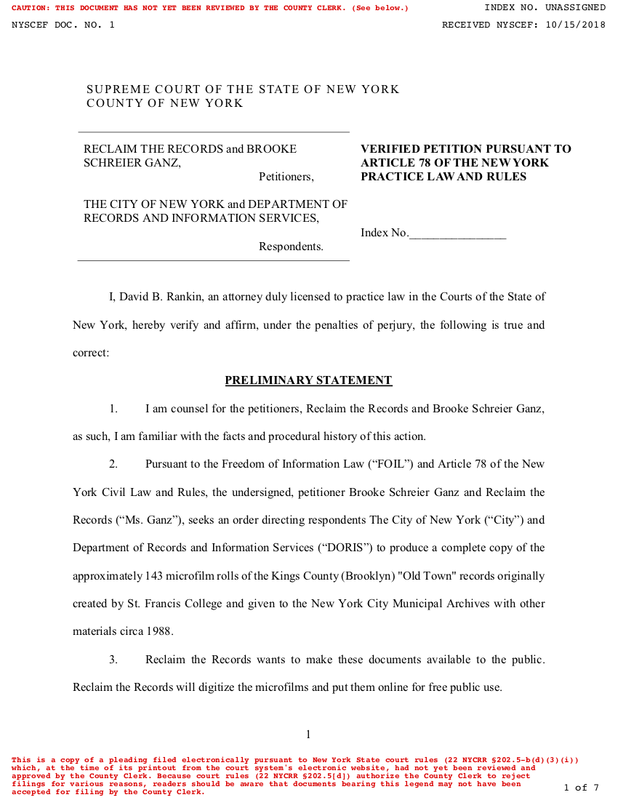 We at Reclaim The Records remain ready and willing to file as many lawsuits as it takes for DORIS and the New York City Municipal Archives to accept your responsibilities under the law. Public records belong to the public. We look forward to winning the copies of these historic Brooklyn records and putting them online for free use, where they belong. On August 6, 2018 we filed our FOIL Appeal. 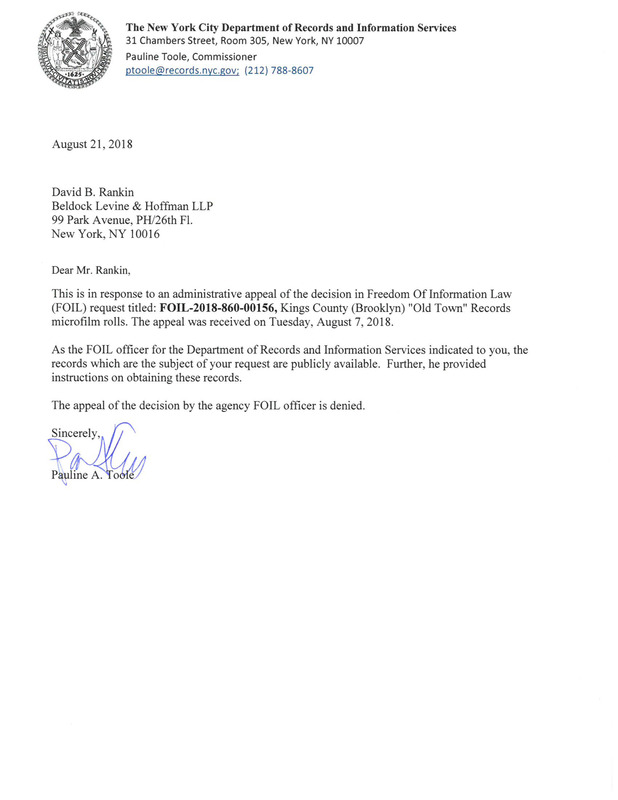 On August 21, 2018 our appeal was rejected by Pauline Toole, who is the Commissioner of the Department of Records and Information Services for the City of New York. She did not provide any legal reasoning at all for her denial, other than to double down on repeating that the records are publicly available, seemingly unknowing or uncaring that this obviously means the records are subject to the state Freedom of Information Law, and copies must be made available upon request and upon offer to pay for the duplication. And so on October 15, 2018 we sued the city in the Supreme Court of New York for the return of the records to the public. Stay tuned to our website, our Twitter feed, and our Facebook page for updates. We hope you all want to see these amazing historic New York records as much as we want to publish them. If the Archives wants a fight, we can surely oblige them. The Archives didn't even bother to cite any laws in their denial. 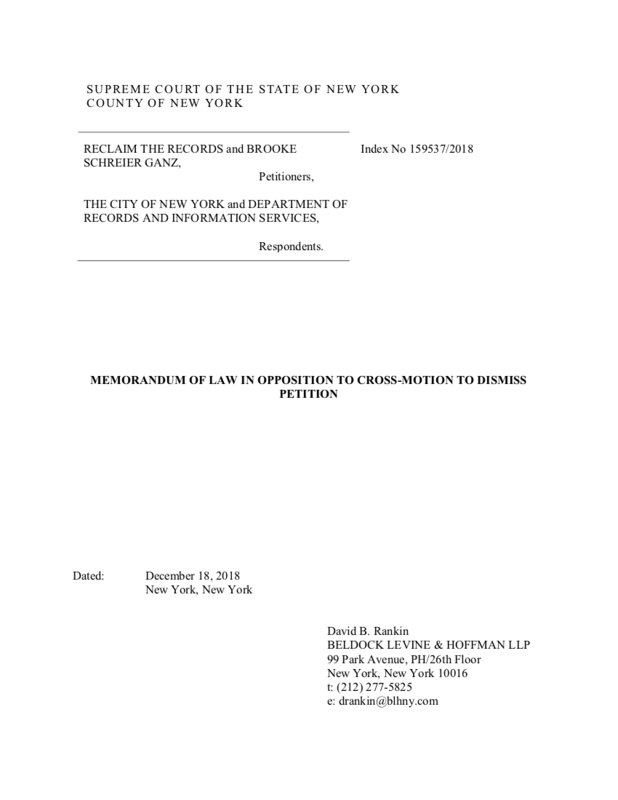 The New York State Committee on Open Government (COOG) wrote an Advisory Opinion in our favor in 2015, letting the New York City Municipal Archives know that their microfilms are indeed covered by the New York Freedom of Information Law (FOIL) and that they needed to provide copies to us. The NYC Municipal Archives chose not to listen to them back then (so we sued them and won a settlement, and got our records) and they're choosing not to listen to them again now. And here's the lawsuit, filed in the Supreme Court of New York on October 15, 2018. DORIS submitted their paperwork, in which they argue that they don't have to make copies under FOIL if the records are available to browse on site. It's pretty light on legal citations, and heavy on "but we don't wannnnna". And then we filed our paperwork in response, explaining patiently to them that "AND means AND" in the New York State Freedom of Information Law. Number of Records (Estimated): Approximately 143 rolls of microfilm, with probably tens of thousands of records on them.